Colour is the essence of India in many ways, with bright “Indian” colours being a strong visual aspect in our lives. Kutch, Gujarat, the land I come from, is no different. 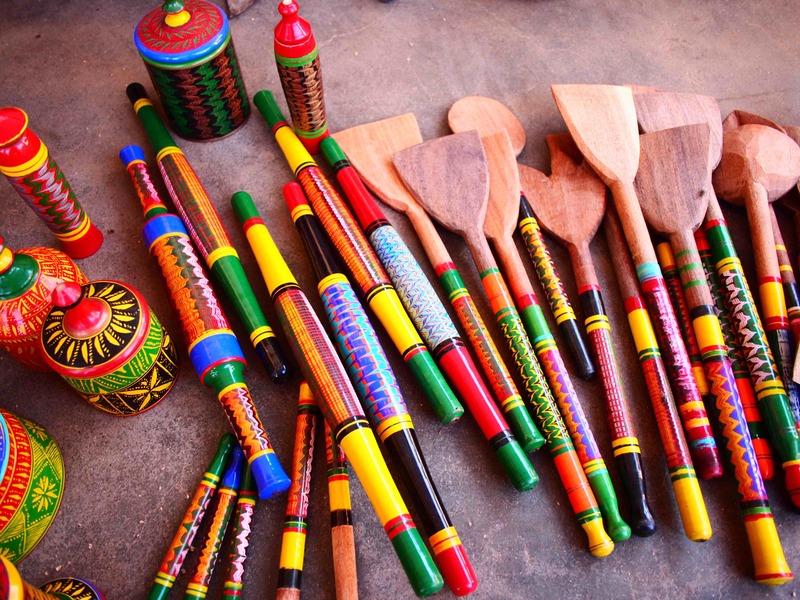 I, the famous wood and lacquer work of Gujarat – a craft that involves colouring hand-carved wooden items with lac obtained from trees – was born from deep within the state’s rich, unique heritage of handicrafts. But what is lac, you wonder? Lac is a natural resinous substance sourced from a crimson-red tiny insect called kerria lacca, which secretes a resin around itself to form a protective covering. These insects were traditionally found in abundance in forest areas. Amazingly, an entire chapter in the Atharva Veda talks about the Lakshataru or the lac tree, and the habits, characteristics and usefulness of the lac insects! However, over time, with the dwindling lac insect population, the craftsmen began to collect and prepare the resin from certain species of local trees. Today, the craft revival has transformed manifold, making the raw material directly available in the markets. My most obvious characteristic is of simple zig-zag, kaleidoscopic patterns, formed from a myriad of contrasting colours which injects a new life into any and every object I am lacquered on. I can be found everywhere – from furniture items like tables, chairs, window panels and legs for beds to the smallest, most nondescript items of everyday use like kitchen cutlery as spoons and ladles, chakla – belan (board and rolling pin), idols, charpoy (bedsteads), toys, bajot (stool), khandani (pestle and mortars), spice storage pots, churners, even dandiya sticks for Garba. A quick walk down memory lane reveals how traditionally, I was popular due to the prevailing social custom of presenting the bride with lacquered items like ghodiyun (cradle), utensils, cutlery, bangle stands, furniture, incense stick holders, and toys. In the past, Gujarati royalty have also been known to gift lacquer ware as gifts to royalty and important people from other countries. My makers are local artisans or the tribal semi-nomadic Wada community of carpenters who live in the Banni area of Kutch, in and around the villages of Nirona (Nirona came from Niro-Vadha, with Niro meaning ‘place’ and Vadha meaning ‘one who cuts wood’) and Bhirandiayara. What is fascinating is that these craftsmen are the original migrants from beyond Sindh, where the work began and is still practiced in a region known as Hala. Another famous area for lac work in wooden furniture is Sankheda, a small village about 80 km from Baroda, Gujarat, which is known to have its own distinct style. The craft is so deeply inherent in the collective identity of the artisans of Sankheda that their town is named after sanghedu, which is the word for ‘lathe’ in Gujarati. Sankheda furniture is said to have been around since 1855, and even today, nearly a 100 families of the Kharadi-Suthar community are actively carrying forward this craft and see it as a crucial part of their collective identity as a community. An example of this identity is the division of labour and inter-dependency among the craftsmen, with someone mastering the lathe-turning, while another is an expert in painting the pattern on the furniture. The fact that the door of every workshop is open for anybody to enter again reflects the trust and togetherness within the community. 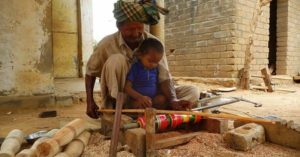 Since these workshops are located in the artisans’ own homes, the passing down of the craft to the next generation is also ensured at an early age. Apart from Sankheda, some other regions of Gujarat like Surat, Saurashtra and Kutch are also well known for their furniture and woodcrafts with lac designs. In Mahuva and Idar in Gujarat, lac is used for making excellent toys. But how I am made is the most amazing part of my story, with the process being as beautiful as the product. 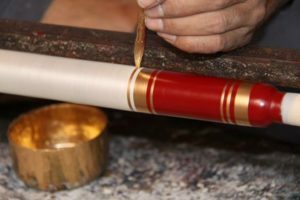 My craftsmen make a variety of ornate items, lacquering them on the round and flat areas on a manual lathe. 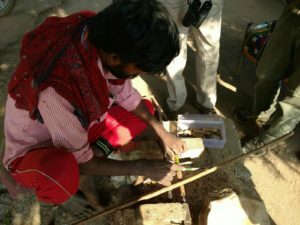 Country wood like babool or hard mango wood is first cut into basic forms, after which each piece is individually put on the lathe, which is manually powered using a stick and rope mechanism. 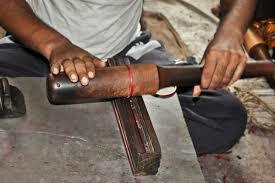 The wood is then shaved and smoothened using wooden tools, following which it is given a cast of violet dye. To paint the designs in bright hues of red, black, yellow, green, maroon, vermillion, gold, and silver, an emulsion prepared from kalai (tin) is used. The coloured parts are etched with the help of a brush made from very fine squirrel’s hair dipped in harkalai, a blend of dyes, powdered zinc, lac and resin. To give the characteristic glossy appearance of lac, the product is polished with a hard stone called akik (agate). This process is followed by a coating of transparent lac with a lacquer stick with the help of friction and heat created by the lathe. Finally, the kevda leaf is used for finish and gloss, giving the end-product a fiery golden-yellow. While the traditional Sindhi designs of bold patterns and vibrant colours has been retained, the government schemes, tourism, and continued exposure to changing trends in the Indian design world have led the Kutchi artisans to move on to new, abstract patterns. The predominant fusion of floral and geometric patterns is locally called the atishi style of lacquering. But beyond the colours and designs that adorn me, the skill and geometric precision of handcrafting identical perfectly lacqured pieces that fit together to form pieces of furniture is what is astounding – proof of the craftsman’s dexterity and mastery over the age-old craft. Over the years, my craft has undergone changes, with some craftsmen setting up motorised machines to turn the lathe. In some places, the original lac coating is now being replaced by melamine and paint; natural colours being replaced by synthetic ones. But the beauty and authenticity of wood and lacquer ware made from natural lac is incomparable, and essentially, the motifs and designs remain unchanged. As long as Indian crafts are given the nurturing and rightful place in the country’s heritage, what this craft stands for will remain a significant symbol of Gujarati art and heritage forever.